Guest review by my favorite brother, Christopher, who has been with us before. Everyone say "howdy!" and be friendly now! To be honest, I did not know what to expect as I began reading Broken-Down House , by Paul David Tripp. I knew the author to be solid, but I simply could not make heads or tails from the title. I am very glad that I had the opportunity to discover this book though. 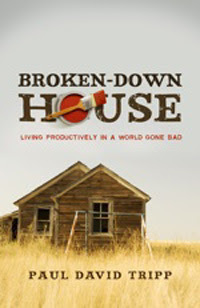 Broken-Down House is about applying the Christian worldview on a “street level”; in one-on-one relationships and situations. In other words, Mr. Tripp (who is both a licensed Counselor and Pastor) encourages us to see the world and its inhabitants as they really are, using the analogy of a Broken-Down House. Just as houses can fall into disrepair and need extensive remodeling, which can be very difficult to live through, likewise this world in which we reside is broken by sin and is presently being restored by God, its owner. Living through the remodel though, is not too much fun. What does this mean for us? It means first that we must be aware of our own need to have our brokenness healed by the grace of God. It means that we need to put our hope and confidence not on other broken people, but in the God and Savior whose transforming grace has the power to restore us, our families, and this whole world to a state of joy on this earth and eventually to a place of everlasting bliss with Him. “So grace is a story and grace is a gift. It is God's character and it is your hope. Grace is a transforming tool and a state of relationship. Grace is a theology and an invitation. Grace is an experience and a calling. Grace will turn our life upside down while giving you a rest you have never known. Grace will onvenience you of your unworthiness without ever making you feel unloved. A strong emphasis in the book is that, once we have come to grasp our own nature and the state of the world we're in, the next step is to move forward ready to minister. And the ministry pictured is not a limited one, but a life-wide ministry that encompasses every relationship and every vocation we will ever be engaged in. The whole world is in need of repair, and if we have Christ then we have exactly what this world needs if it is to be salvaged. I would recommend this book to Christians of 20+ years, who are perhaps a little bit road-weary with life and need to be re-energized with a vision for how they can move forward. Not that anyone couldn't benefit from the book, but I think people in that situation would find it most helpful. For some reason I thought this was a parenting book? Why would I get that impression? Now I am wishing I had investigated a little more closely--sounds great! Oh yeah, and I'm reading a devotional by Tripp now. It's fantastic! Perhaps because Tripp is best known for his parenting book, "Sheperding a Child's Heart"? Anyhow...the devotional sounds good too. Great review and seems like a book worthy of consideration. Perhaps I can clear some confusion. "Broken Down House" was written by Paul David Tripp and "Shepherding a Child's Heart" was written by Tedd Tripp, Paul's brother.